Support IMIP in providing the best medical care for the most needy population in the North East of Brazil. In 1960 a group of doctors led by professor Fernando Figueira launched Imip: Instituto de Medicina Integral Professor Fernando Figueira. Imip is a non-governmental, non-profit organisation that is devoted to social-medical assistance, teaching, research and community extension. Targeted towards the most needy population, Imip’s Hospital Complex is recognised as one of the most important health institutions in Brazil, being a reference in several medial specialties. 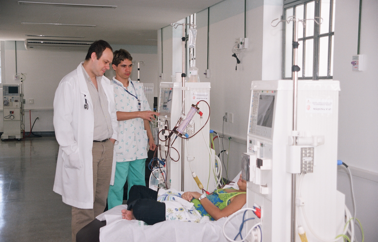 It counts over 600 thousand consultations a year in its 714 rooms and was the first hospital in Brazil to receive the title ‘Child Friendly Hospital’, given by the World Health Organisation, UNICEF and Health Ministry. Imip believes a healthier society is built by taking good care of its people. IMIP’s aim is to take good care of people, to know and to respect their rights, and to contribute to their dignity as citizens. Imip defends human rights, and the key principals that have always been a part of IMIP’s practices are love, respect, ethics and solidarity, making it one of the most prestigious health institutions in Brazil. Crucial to Imip’s fundraising is the Bazar, a little shop that functions all year round and that is open inside the hospital area. It receives donations of clothing, domestic equipment, toys and other used and new products. These are sold for reasonable prices, especially to Imip’s clientele. The Bazar not only raises funds to Imip but also provides low-cost goods to the people who need them. The aim of the placement is to create campaigns to increase both donations and sales at the Bazar, to ensure the work and support that Imip offers can continue to grow.